Shelters open Sunday, November 26, 2017! We have the volunteer calendar up and running! Please check it out. Winter is right around the corner and we need your help! 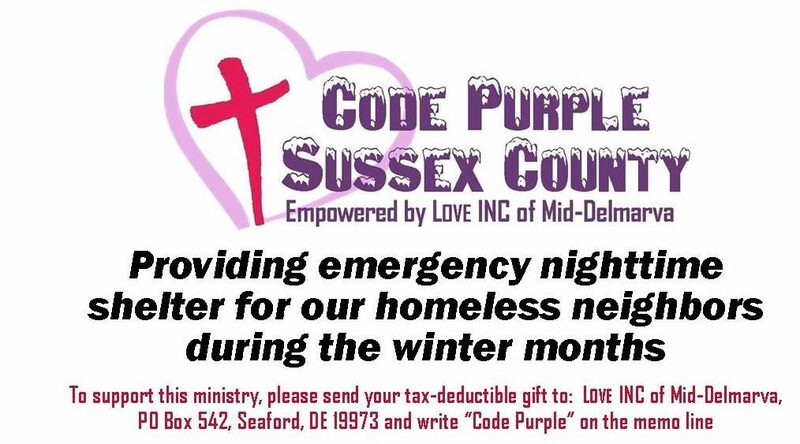 Just click the link above to have direct access to the Code Purple Sussex County Shelters calendar. You can sign up for any day, position, and town that suits you best. If you have any questions about the calendar, you can email us at codepurplesussexcounty@gmail.com or call 302-519-0024. We know that you will be blessed by serving!